Mita, an Anganwadi worker, has been working in Patralekha Anganwadi Center of Kolkata for more than 20 years now. Her daily routine involves supporting pregnant women and nursing mothers, providing kids with healthy food intake and engaging them through innovative and interactive learning sessions. 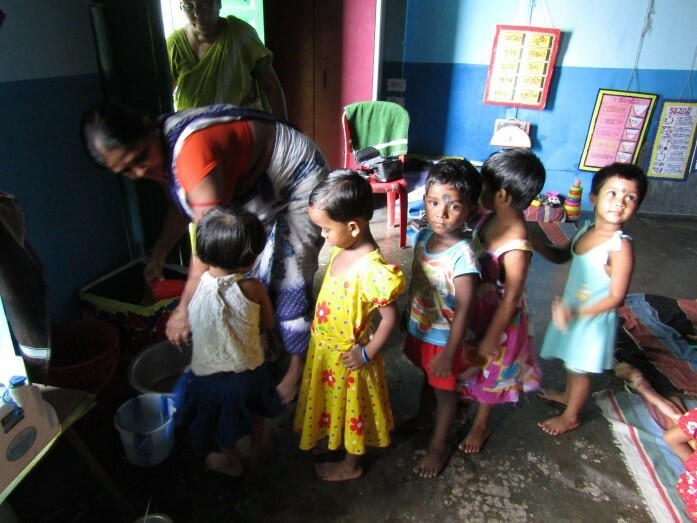 CII Foundation (CIIF) has joined hands with UNICEF India to create the CII-UNICEF CSR Hub in West Bengal to strengthen the service delivery mechanism of Anganwadi Centers through its Anganwadi Adoption Program, targeting 46 Anganwadi centers in Metiabruz area of Kolkata. CIIF mobilized corporate support to create model Anganwadi centers to reduce morbidity, mortality and malnutrition of children, and of pregnant and nursing mothers. The project targets the most vulnerable groups within society, belonging to poorest of the poor families and living in disadvantaged areas and urban slums. “There has been a lot of change after CII Foundation started managing the center in 2014. They taught us how to teach children effectively and the diet and nutrition required for children and mothers. The number of children coming to the center has increased, with an increase in attendance rate. They like to visit the center even during vacation,” beams Mita. Additional nutritional supplements in the form of bananas and an early morning snack of Bengal Gram chaat are provided to the children. On alternative days, the food provided by the government is augmented with additional protein in the form of soya chunks, badam chikki and ground peanuts. Apart from the availability of food, the quantity and quality of food is also ensured. CII-UNICEF CSR Hub, together with the Department of Women and Child Development, Government of West Bengal, is focusing attention on the first thousand days of motherhood (9 months of pregnancy, and 2 years following child birth). Expectant mothers are provided with vital nutrients like iron and folic acid and awareness is created on the significance of breastfeeding for the first six months for a child. Women are taught about the significance of good hygiene and sanitation to combat diarrhea and other health crises. Water filters are installed in the Anganwadi centers to ensure safe and clean drinking water, and hand washing and personal hygiene is being encouraged by Anganwadi workers. Further, CII is initiating the process of constructing child-friendly toilets to promote sanitary practices at the centers. The project also ensures the immunization of pregnant women and infants which protects children from six vaccine-preventable diseases such as poliomyelitis, diphtheria, pertussis, tetanus, tuberculosis and measles. The immunization record-keeping is maintained properly at the Anganwadi centers. The children and mothers are happy with Mita’s work and the work done in the Anganwadi center. She knows that she needs to work hard so she can keep going and help women and children lead a healthy life. “Health is important. If you are malnourished, then you will be stunted in your development, and you won’t do well. The poor have to work harder, and if they remain healthy, they can come out of the poverty that binds them,” she says.